Some women suffer from the agony of a miscarriage not once but a number of times. Now a new UK-Dutch study explains that the resulting multiple miscarriages is because their womb may implant embryos even if they are of poor quality. The researchers say that the women who suffer from multiple miscarriages have a womb that cannot differentiate between viable or good embryos and the not so good ones. The research was conducted at a small level including six women who had suffered from recurrent miscarriages and six women with normal pregnancies. 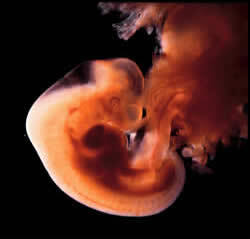 High or low-quality embryos were placed in a channel created between two strips of the womb cells. In women with normal pregnancies the cells began to grow and reach towards the high quality embryo whereas low quality embryos were ignored. The women who suffered from miscarriages had a womb where all embryos easily embedded regardless of the quality of the embryo. Recurrent miscarriages affect one in 100 women in the UK. One expert not involved with the research said that it could help develop a test that could identify this condition in women. Dr Siobhan Quenby, from the Royal College Obstetricians and Gynaecologists, said that this study was important as earlier it was believed that rejecting good embryos led to miscarriage, whereas the reason was quite the opposite. She hoped that further research would help to detect if the receptiveness of these women could be altered so that they only had pregnancies that resulted in birth.